Joe and Marlene make this dish in SCRUMPTIOUS! I love to eat stir fry, but I don’t love to make it. It’s hard to get all the vegetables cooked perfectly with no soggy factor. In Asian kitchens, they have woks the size of coffee tables with real fire under there. That makes all the difference to a stir fry. When I want carrots or broccoli in this dish, I cook it ahead of time, shock it in cold water and just heat it up in the sauce at the end. Cheating? Um, yes. But I don’t have to apologize for overcooked veggies! That’s why I like this recipe. No sog factor and if you do everything in just this order it will come out right. As an extra little kick in the pants, the last time I cooked this dish, I made the jasmine rice in the microwave in a Corningware casserole dish! Shazam! An hour before you want to start cooking, put 2-3 good sized chicken breasts in the freezer. Single layer, covered with plastic wrap. Partially frozen chicken breasts are easier to slice thinly. Start cooking 1 ½ cups rice according to the directions on the box or bag. 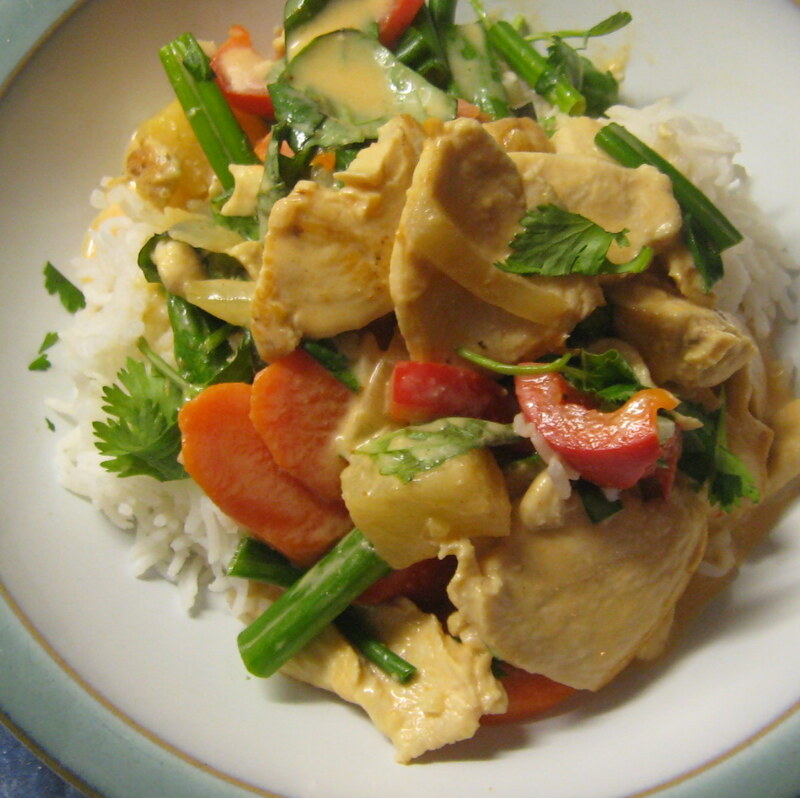 Pour the coconut milk into the pan with the veggies and stir it around with your spatula. Add the red curry paste to one corner of the pan and whisk it in. Add sugar, salt, pineapple chunks and up to ¼ cup of the pineapple juice if you so desire. My amounts are guidelines. Balance the heat, sweet and salty to your own taste. When the sauce is bubbly, add the chicken back into the pan and cook, stirring occasionally, until the chicken is done in the middle. Taste again, just in case you need to add more salt. Or something. To serve, spoon rice into a bowl. Ladle the curry on top. Garnish with basil and cilantro. Enjoy! *Red curry paste can be found in a jar with the international foods in many regular grocery stores or in a can in Asian groceries. One Tablespoon isn’t going to make it very hot but any more than that and my kids won’t eat it. My husband and I usually kick our bowls up with Sriracha, a Vietnamese chili-garlic sauce that can be found near the red curry paste at the store. Look for the green cap and the rooster!